206. Shioji, Ursula. 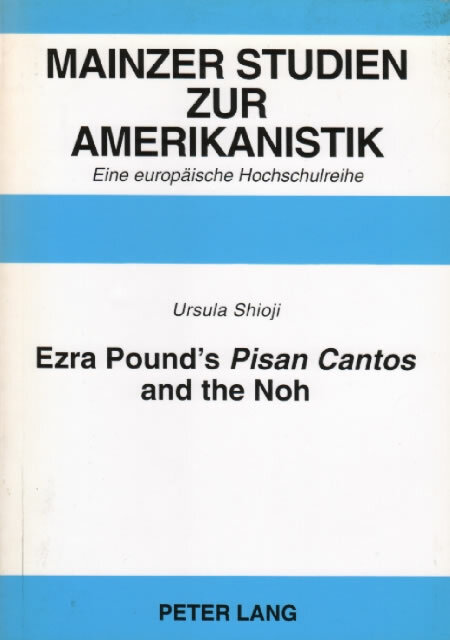 Ezra Pound’s Pisan Cantos and the Noh. Frankfurt am Maim: Lang, 1998. Shioji’s work approaches references to the nô in The Pisan Cantos (56) primarily via the recondite theories of intertextuality advanced by Claes Schaar, and so includes discussion of, for example, ‘Location of Surface Contexts and Infra-contexts and their Analysis on the Vertical and Horizontal Axes of the Poem’. The work is nonetheless useful for its painstaking identification of ‘the frequency and distribution’ of Pound’s references to the nô at Pisa, and for its overview of earlier writing on the subject in English, German, and Japanese. Includes frequent consideration of Pound’s interest in the haiku.